Micatech is proud to announce that Pack Racks are now available for the Kawasaki KLR650E (’08-) and Triumph Tiger 800 & 800XC (’11-). 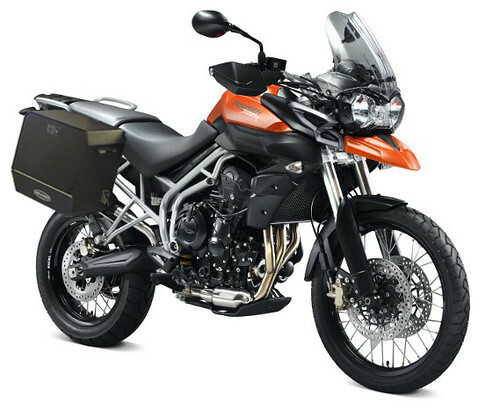 Last spring we offered a significant savings on V2 cases to celebrate the release of the new Triumph Tiger. The response was fantastic and many of you asked about adding a top case. At the time, we didn’t have a Pack Rack, the critical connection piece to attach a Micatech Top Case to the motorcycle. However, thanks to a local Tiger rider, we got our hands on one of the new bikes and starting designing a new Pack Rack. Motorcycle manufacturers don’t always make it easy to design accessories. Fortunately, the folks and Triumph left the tail of the new Tiger accessible. After a few iterations we came to a design that’s functional, durable and stylish. The Pack Rack compliments the sleek and rugged lines of the Tiger while adding a sturdy platform for extra storage capacity with a Buy prednisone. The Top Case is back far enough to allow two-up riding and doubles as a Neurontin quick shipment for your passenger! By the same token, we keep it as far forward as possible in order to keep the weight towards the center of the bike. Not only did we add in plenty of places to attach bungee straps, we made them big enough for plastic tip models and ROK straps. And if you’re headed out far off the beaten path, we’ve included an option to mount RotopaX containers for extra fuel/water storage. In addition to the Triumph Tiger, we took a look at one of the greatest adventure bikes of all time – the Kawasaki KLR650. We have a few of the first generation (A) models around the shop but it wasn’t until our friendly local KLR rider, Skip, let us borrow his new (E) model. In 2008 Kawasaki revamped their dual sport and it quickly became the bike of choice for many adventure riders. You emailed, called, and posted on our ADVrider thread that you wanted the ability to mount a Micatech Top Case onto your KLR650E. We listened and got to work. The simple and rugged design replaces the standard KLR rear rack and adds extra tide down points, quarter-turn connectors to quickly mount a Micatech Top Case, and an option to mount Rotopax containers for extra fuel/water storage. All Pack Racks are finished with a black colored industrial powder coat that we do right Buy lasix fedex shipping. Go to the Micatech Online Shop to order your Pack Rack today. A few days ago we had the pleasure of dinner and beers with Pete Johnson. Pete is from Manchester, England and is visiting every Manchester in the USA by motorbike. He conjured this plan a few years back and when an English insurance company promoted a contest – What’s your dream ride? – Pete jumped at the opportunity. There were over 4,000 entries and Pete came out victorious! They have graciously sponsored his motorcycle journey around the USA (and one Manchester in Canada). Pete is just starting out on his adventure. He flew into Boston and visited Manchester-by-the-sea in Massachusetts before we showed him around our Manchester in New Hampshire. His first few days have been clouded with rain (thankfully he’s used to that kind of thing) but he’s looking forward to brighter days. After leaving us in New Hampshire he was off to Manchester, Maine and then Manchester, Vermont. Hmmmmm… This could get repetitive. We wish Pete well on his amazing adventure. You can follow him on Facebook, Twitter, and his blog (United States of AManchester) or on one of the hundreds of local TV/radio/newspaper gigs he’ll be doing along the way. So, what is your dream ride? In the past whenever I would go to a Rally or take a cross country trip I would always wish I had my Mt Bike when I arrived a my destination. Now I no longer have to wish. The 2x2cycles Rack works well with the Micatech Panniers. The spaciousness of Micatech Panniers gives me plenty of room to safely store my boots and riding suit when stoping for a Mt Bike ride. Plenty of room for my Ortlieb bag (or bags depending on how I configure) on top. We love what you’ve done ray. Keep on riding (and riding)! Recently we left the northern cold and headed for the warmth of the south to attend the BMW Georgia Mountain Rally. It’s one of our favorite rallies of the year and 2011 proved to be another success. The riding was great, the people were friendly, the weather (post tornado) was spectacular, and the food was delicious. All in all about 600 people from all over the south came out for a wonderful long weekend. Three of us (Bob, Sue and Ben) loaded up the Micatech trailer and trucked south for 2 days. After back to back 10 hour days in the truck we were very happy to pull into the campground in Hiawassee, Georgia. Ben found an isolated lakeside campsite and set up his NEMO tent while Bob and Sue opted for the nearby Ramada Inn. Powerful winds, heavy rain, and continuous lightning filled the sky all night as the tornadoes ripped through. In the morning it was terrible to learn that many local communities had been destroyed by the powerful tornadoes. Fortunately, Ben survived the night (but didn’t get much sleep). The next morning was the calm after the storm. We set up the booth and by the afternoon we were on the bikes and enjoying the beautiful roads of northern Georgia. Sweeping curves blanket this area and we really enjoyed the absence of frost heaves. Ben had his GoPro camera rolling and snapped these photos. Being chased by a pitbull! The rally began the next morning with hundreds of motorcycles rolling into the campground. Rally goers put in their bids for some of the dozens of door prizes and strolled through vendor alley. Rather than a large warehouse building, each vendor had their own little wooden cabin. It’s a great setup and the tall trees provided shelter from the sun while still allowing a cool breeze to blow through. For two days we talked with hundreds of riders any said hello to many of our existing customers. Saturday night closed with a tasty grill-your-own steak BBQ and live blue grass music. Again the weather was perfect. After packing up the trailer and enjoying a cold Yuengling (It’s a shame these aren’t sold in NH) we were absolutely exhausted from a long and enjoyable day of work and promptly retreated for the night. The Paxil usa hard at work. Early the next morning we packed up the bikes and hit the pavement. This time we headed north into North Carolina and explored some new and exciting roads. Shortly after setting off we stopped for gas and treated ourselves to a delicacy of the south – Boiled Peanuts! There’s no better place to sample this gem than from a gas station in the middle of the backcountry. If you haven’t yet sampled these, you’re truly missing out. As we held our breath we struggled to stomach the moist and mushy peanuts. We all had a good chuckle watching the others make funny faces. With so many beautiful roads and friendly folks, we’re sure to be back next year for another round of curvy roads and boiled peanuts. Our next rally is the BMW RA Firecracker Rally in Chippewa Falls, Wisconsin starting on June 30th. We’re looking forward to another great rally and hope to see you all there!